I have recently been searching for Advent Calendars that I thought Gee might like as she is not that bothered about chocolates but is becoming increasingly interested in make up. A lot of the store advents seem quite expensive though, so I managed to find a few that would be ideal. 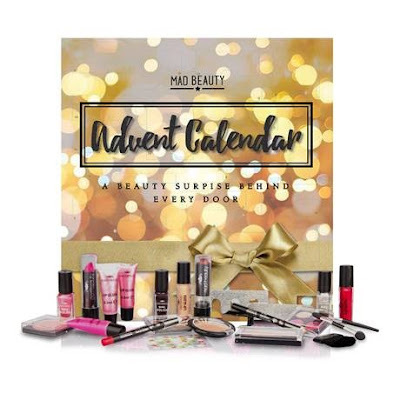 The Mad Beauty advent calendar includes: 2 x Lipsticks, Powder Compact, 3 x Nail Polish, 3 x Lip Gloss, 2 x Lip Gloss, 2 x Eye Shadow, Eyeliner Pencil, Lip Liner Pencil, Blusher, Blusher, Sharpener, Toe Separator, Lip Brush, Blush Brush, Nail File, Applicator and Nail Stickers. The Mad Beauty Advent Calendar is available from Find Me a Gift and costs £16.99. 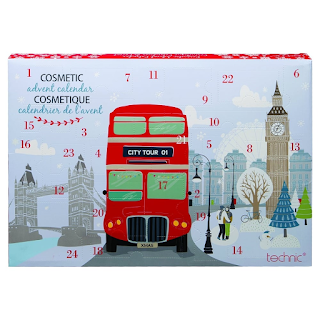 I love the British feel to the new Technic Cosmetic Advent Calendar. This includes: 3 Nail Polishes, Bronzing Compact, 3 Lip Glosses, 3 Eye Shadow Compacts, Eyeliner, Lip Pencil, Mascara, 3 Lipsticks, Nail Stickers, Emery Board, Mirror, Pencil Sharpener, Blusher Brush, Toe Divider and Blusher. Priced at £14.95 it is available from Just My Look. This calendar includes: 1 x Hand Cream (Savannah Fragrance), 1 x Body Lotion (Savannah Fragrance), 2 x Bath Salts (Savannah Fragrance), 2 x Bath Fizzer (Savannah Fragrance), 1 x Body Wash (Savannah Fragrance), 1 x Lip Balm (Cherry), 1 Lip Balm (Strawberry), 2 x Nail File and 1 x Body Puff. I love this calendar as everything in it is so Christmassy, priced at £9.99 it is available from Find Me a Gift. 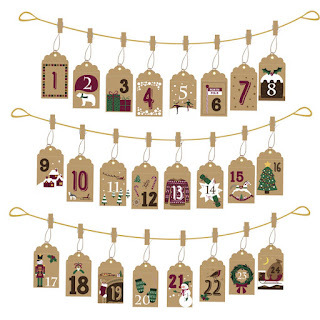 For something a little different this is a beautiful Hanging Envelope Calendar which includes 24 Christmas Themed Envelopes, 24 Mini Wooden Pegs and 3 Festive Golden Strings to hang them from. These would look perfect as a decoration on their own or could be filled with a little surprise for each day of Advent. Priced at £6.99 it is available from Born Gifted. 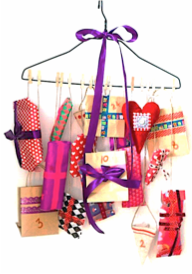 Or you could create your own advent calendar by wrapping 24 small gifts and hang them from a decorated coat hanger, this is a Danish tradition and looks really effective. I found a great website that offers quirky gifts at really good prices called UK Flying Tiger something to amuse the kids for hours. Have you seen any calendars that would be perfect for older children that may be suitable? I was sent some of these items for the purpose of this post but the opinion is my own. I don't know about tween girls but would love one of these myself! These look great I like that you can get alternatives to chocolate. The last few years I've had an advent calender for me and found it a real treat. Good to see something that isn't chocolate. I like most of these for myself! Fab selection. I really like these advent calendars. They look great. i think these are a great idea. A cheaper way of trying out new products. The Pakkekalende looks cool, we'd love a type of make your own version!